To identify mechanisms for the successful implementation of support strategies for health-care practitioners in rural and remote contexts. This is an integrative review and thematic synthesis of the empirical literature that examines support interventions for health-care practitioners in rural and remote contexts. This review includes 43 papers that evaluated support strategies for the rural and remote health workforce. Interventions were predominantly training and education programmes with limited evaluations of supervision and mentoring interventions. The mechanisms associated with successful outcomes included: access to appropriate and adequate training, skills and knowledge for the support intervention; accessible and adequate resources; active involvement of stakeholders in programme design, implementation and evaluation; a needs analysis prior to the intervention; external support, organisation, facilitation and/or coordination of the programme; marketing of the programme; organisational commitment; appropriate mode of delivery; leadership; and regular feedback and evaluation of the programme. Through a synthesis of the literature, this research has identified a number of mechanisms that are associated with successful support interventions for health-care practitioners in rural and remote contexts. This research utilised a methodology developed for studying complex interventions in response to the perceived limitations of traditional systematic reviews. This synthesis of the evidence will provide decision-makers at all levels with a collection of mechanisms that can assist the development and implementation of support strategies for staff in rural and remote contexts. An important goal of health services is to provide accessible, equitable and efficient health care. The delivery and organisation of rural health care has seen significant changes over the past decade . These changes have dictated the need for a rural health workforce that is adaptable and equipped with the skills and knowledge to diversify service delivery models . However, the ability of rural health services to support adequately skilled and adaptable health practitioners is hampered by a number of factors including: poor recruitment and retention of practitioners ; shortages of practitioners ; high clinical loads, particularly for sole practitioners ; limited access to formal mentoring or supervisory relationships ; poor relationships with management [4, 5]; difficulty accessing professional development activities or continuing education [4, 5]; limited access to relief to allow professional or service development [4, 6]; limited career pathways; limited or no dedicated work time allocated for professional reading or study ; and new graduates and sole practitioners possessing limited skills in service development . The positive impact of the content and educational techniques utilised for continuing medical education (CME) interventions [8–10], training interventions , supervision  and mentoring  on the competence of the health workforce has been demonstrated elsewhere. It is less clear, however, how and to what extent the contexts in which such interventions are delivered contribute to their effect on staff, service and even patient outcomes. This is particularly the case for supporting health practitioners in rural and remote contexts where accessing, delivering and participating in appropriate support opportunities is influenced by the complexity of the rural and remote environment [14–16]. Professional or geographic isolation, lack of financial resources and the costs of travel, time away from work, and cover and relief are common factors limiting support for practitioners in rural and remote areas. As Cameron et al. (p. 6) summarise: ‘Geographical location makes professional development a challenge, while isolation makes it essential for professional growth and peer support’ . Recent evidence shows that a therapist’s decision to locate to, stay or leave a rural community is influenced by the availability of and access to practice supports, opportunities for professional growth, organisational commitment to supporting the practitioner and understanding the context of rural practice . The need for more research to evaluate the effect of access to relevant continuing professional development (CPD) (as a form of support) on staff retention and, ultimately, rural health-care outcomes has been acknowledged  in particular by the World Health Organisation (WHO). The WHO’s policy of improving retention of rural health-care workers recommends that governments ‘design continuing education and professional development programmes that meet the needs of rural health workers and that are accessible from where they live and work, so as to support their retention’ . However, the relation between the rural and remote context in which a support strategy is implemented and the mechanisms that facilitate or hinder the effect a support strategy can have on staff, services or patient outcomes has been poorly explored. The limitations of more traditional systematic review approaches in exploring issues in rural and remote health-care contexts have been established . Therefore, using an integrative review and thematic synthesis of the literature, the aim of this paper is to identify: the range of support interventions reported in the literature for health-care practitioners in rural and remote contexts; how the success of support interventions is measured and defined; and the mechanisms that may contribute to the success of these interventions in rural and remote contexts. The use of an integrative review expands the variety of research designs that can be incorporated within a review’s inclusion criteria and allows the incorporation of both qualitative and quantitative information . For the purpose of this paper, we have chosen to use the term support to encompass a number of concepts that can be seen as models of professional support. Namely, we were interested in exploring support in terms of supervision, mentoring, professional development and more general support interventions (for example, the provision of locum relief, support from colleagues and networks of practitioners ). These concepts are considered potentially modifiable factors that can contribute to a health-care practitioner’s decision to leave or stay in rural practice . The term professional support has also been recently utilised to examine the utility of a professional support framework that encompasses a suite including professional supervision, mentoring, peer group supervision, peer review, work shadowing, in-service programmes and journal clubs (p. 562) . We acknowledge that traditional definitions of several of these concepts overlap with one another. Both supervision and mentorship, for example, can be seen as models of professional support. Hence, the scope of the interventions explored in this review is deliberately wide; however, the population (or contextual) focus, that of rural and remote health practitioners, is relatively narrow. We envisage that by exploring the broader concept of support, we will identify an appropriate suite of mechanisms to support health practitioners in rural and remote contexts. Articles were included in this review if they empirically explored any intervention that was aimed at supporting health professionals in a rural or remote context. Specifically, the concept of support was explored in terms of support, supervision, professional development and mentoring (see Table 1 for a full list of search terms utilised). We limited our search to the period 1999 to 2012 as technological advances made since 1999, such as the development of the internet and laptops, have introduced new contexts in which support interventions for rural and remote practitioners are delivered, which we were keen to explore. Only those articles published in English language literature were included. Beginning of 1999 to end of 2009. Updated in 2013 to include beginning of 2010 to end of 2013. Inclusion: Empirical research study of an intervention aimed at supportingb health professionals; involves rural and remote populations; report evidence of outcomes related to staff, service or patients. Exclusion: No abstract for review, article is a commentary piece, or editorial. aDetailed in the decision tree of Table 2; bsupport refers to professional development, supervision, mentoring, continuing education, assistance, encouragement and resources that contribute to clinical practice, service delivery and staff satisfaction. No report was excluded based on the data evaluation system described below; however, the strength of a paper was considered when reporting findings. When screening papers for inclusion we relied solely on the use of the terms ‘rural’ and ‘remote’ by the authors of the papers, although we acknowledge that the terms ‘rural’ and ‘remote’ can be explicitly defined using a more formal classification . Where available we have detailed the authors’ definitions of ‘rural’ and ‘remote’. Broad eligibility criteria were used to assist with problem identification  and the capture of the full extent of literature in this field. A research assistant (JY) searched the electronic, peer-reviewed literature for the period 1999 to 2012 using guidance from Booth . Multiple databases were utilised in the search and are outlined, along with key search terms, in Table 1. After removal of duplicates, an initial review of titles and abstracts produced 2,743 results (Figure 1). To better focus the review, 50 abstracts were randomly selected and jointly reviewed by two researchers (AM and JY). A joint decision was made as to which studies were relevant to the study aims and which were not, resulting in the construction of a preliminary decision process (outlined in notes accompanying Figure 1). This was used to screen the remaining references. By focusing the review, the number of potentially relevant sources was reduced from 2,743 to 790 papers. PRISMA flow chart of the integrative review. † abstracts screened using the following inclusion criteria: must have abstract for review; must contain reference to supervision, support (professional development/education), mentoring; must examine issues related to health care practitioners (and not undergraduate students); must be empirical research (not commentary, discussion or editorial); must be rural, regional or remote. Five researchers then independently screened an allocated set of abstracts using a pro forma for screening (Table 2), reflecting the inclusion criteria outlined in Table 1. This process resulted in a final set of 46 full text articles, which were read and assessed for eligibility for inclusion in the review (Figure 1). A total of 43 articles were included in the final review. 1. Does the paper relate to supervision, professional support or mentoring? 2. Does the paper describe a research study or evaluation (that is truly empirical)? 3. Is it a systematic review? Does the study describe: development of the intervention or model (input evaluation); implementation or actual intervention of the intervention or model (process evaluation); or evaluation of the intervention or model (impact evaluation)? Does the study analyse change in practitioner behaviour, service outcome or patient outcomes (within a qualitative, quantitative or mixed methods design? Does the study examine rural and remote areas AND health practitioners? The process for assessing quality is complex. Although a number of tools exist, there is no gold standard for calculating quality scores. The use of an integrative review with a thematic synthesis to extract a fuller understanding of ‘relationships, mechanisms and meaning’ within the evidence base  enables extraction of information from research that traditionally may not have been considered for review . As we were primarily interested in qualitatively exploring and mapping the relations between the rural and remote context, the mechanisms of the support intervention and the outcomes of the support strategy, the magnitude of the effect of the intervention itself was not assessed. We therefore used thematic techniques to identify any evidence that linked mechanisms, specific to rural and remote contexts, to outcomes. As such, although the strength of evidence was examined, a quality assessment was not considered paramount to the identification of relations. To broadly comment on the strength of the evidence utilised in this research, each study design was assessed according to its place in the research hierarchy using Daly et al.’s hierarchy of evidence for assessing qualitative research , the National Health and Medical Research Council (NHMRC) levels of evidence model for quantitative research  and mixed methods research was assessed using both Daly et al. and NHMRC levels of evidence for qualitative and quantitative components. Evidence hierarchies reflect ‘the potential of each study included in the systematic review to adequately answer a particular research question, based on the probability that its design has minimised the impact of bias on the results’ (p. 4) . Given the mass of literature identified and the broad concepts explored, further additional hand searches of cited reference lists were not conducted nor were searches conducted within the grey literature or other sources. Thematic analysis techniques (see below) were then applied to the literature in conjunction with conceptual mapping using the mind-mapping software Freeplane to identify: the range of support interventions; the impact these interventions have on patient, staff and service outcomes in order to define ‘success’ and the mechanisms specific to rural and remote contexts within which the identified interventions were applied that may be associated with successful outcomes. Freeplane allows the hierarchical, conceptual mapping of a range of related concepts reflecting synthesis approaches described by Baxter et al. and Mays et al. . Specifically, the thematic analysis approach employed is most closely related to framework analysis , which involves a systematic process of familiarisation with the data, identifying a thematic framework, indexing the themes, charting those themes into a hierarchical framework and then mapping and interpreting those themes. 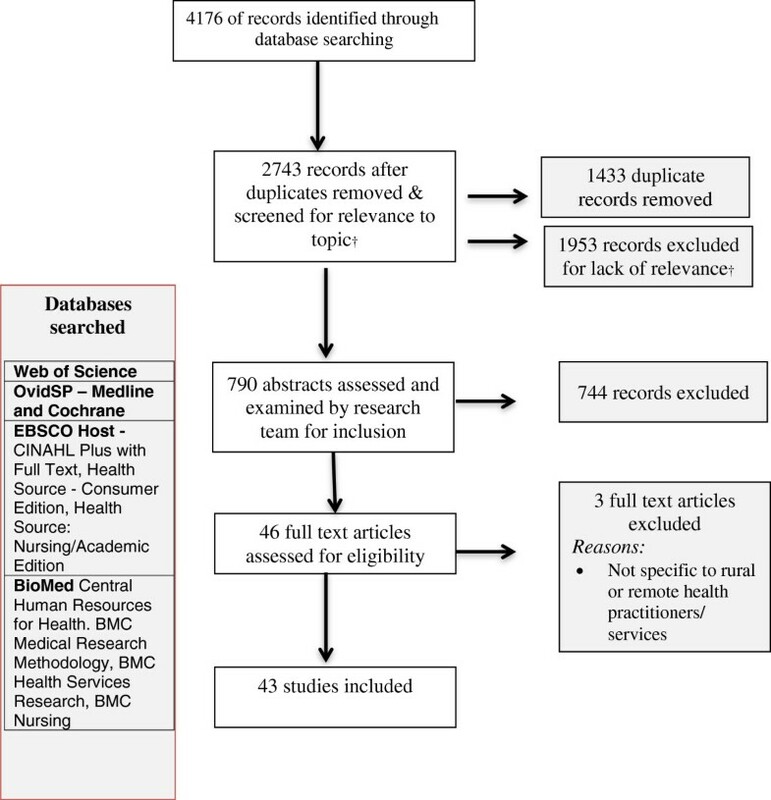 This review identified 43 papers evaluating support strategies for the rural and remote health workforce (Tables 3 and 4). Papers were predominantly from Australia (n = 19), examining medical practitioners (n = 8) or nurses (n = 8) (Table 4). Positive impact: Large change of culture within the mental health programme. The estimated 80% of people initially negative and suspicious about clinical supervision was now estimated to be only 15% to 30%. Considerations: Strategies for sustainability developed included: continuity of review programme and leadership team (working group) to oversee actions and to work with senior management. Positive impact: A multi- faceted intervention strategy can change provider behaviours and improve the quality of inpatient care across a range of high mortality, target diseases. Primary measure: Staff outcomes – workload perceptions. Secondary measure: Staff outcomes – satisfaction and retention. Positive impact: Participant engagement in developing and implementing self-identified work environment issues led to improved workload, work satisfaction and intent to remain. Positive impact: Four themes emerged. Appreciation, connection, active support (for the practitioner and pursuits of the practitioner for example defending health region) and physical and recreational assets were positively related to physician retention. These community factors existed to different degrees but were present in all communities. Reciprocity was a fifth factor that emerged. Positive impact: Agreement on more basic assessment parameters. Less impact: On average there was poor agreement on more complex parameters. Verbal reports often missed vital signs leading to poor agreement between the specialist and non-specialists. Primary measures: staff outcomes – goal attainment and retention. Positive impact: 97% of participants achieved training or learning goals; all participants were using their new or upgraded skills at 5 years; after 5 years, 100% in the matched enrichment group remained in rural practice compared with 71% physicians who did not partake in the EP (RR = 1.31; confidence interval: 1.06 to 1.62; P < 0.05). Only paper to demonstrate a statistical link between supportive context, skill acquisition and retention of rural practitioners. Positive impact: Increase in self-reported knowledge, confidence in practice and skills. Sustainable via participants imparting learnt knowledge via mentoring and workshops to co-workers. May increase number of palliative care programmes. Considerations: Networking and learning about supporting resources were identified as the most important elements of the programme; able to collaborate more as a group to improve services and act as a common voice. Indicated they shared information with other staff via mentoring, meetings, case conferences, formal in-service sessions, formal workshops. Rural: Accessibility/Remoteness Index of Australia (ARIA) categories 1 to 6. Positive impact: Education session evaluation – perceived increase in knowledge by most participants; content was perceived as relevant, appropriate. Regional admission rate increased and prescriptions increased (admission rates and prescription rates not controlled statistically for any other factors so cannot attribute to the intervention per se). Community of 5,000, 60 miles from major metropolitan areas. aTraining and education: Continuing Professional Education (CPE), Continuing Medical Education (CME), Continuing Professional Development (CPD); badministrative staff, palliative carers, Aboriginal health workers, health workers, community members, spouses. The strength of evidence was, overall, low with the majority of studies being either Level IV (NHMRC, quantitative evidence) or Level III (Daly et al., qualitative evidence) (Table 5). One randomised controlled trial (Level II)  and two Level I qualitative studies were identified [35, 65]. The research was predominantly descriptive pre- and post-intervention evaluations using unvalidated questionnaires (Table 3). The most informative qualitative studies explored mechanisms for successful support interventions. For example, Lynch and Happell [33, 34] examined the ‘process and journey’ of a clinical supervision implementation strategy for mental health workers in a rural health service. Interventions were predominantly training and education programmes delivered face to face, remotely or utilising a combination of face-to-face delivery with technology. There were a limited number of evaluations specifically exploring supervision and mentoring interventions (n = 5). A number of papers explored a combination of support strategies (Tables 3 and 4). Four categories of support were identified from the literature (Table 3), generally reflecting the key search terms. These included supervision strategies or interventions, professional support strategies, training and education interventions and mentoring strategies or interventions. Supervision incorporates interventions primarily focussing on the delivery of a supervision programme or the implementation of a supervision strategy. Training and education includes interventions involving training in a particular skill, for example, online training programmes for rural and remote mental health practitioners in cognitive behavioural therapy (CBT) , CPE, CME or CPD. Professional support includes interventions that aim to support practitioners through ‘connectedness’ using networking and collaboration opportunities. It also includes strategies such as supporting practitioners to participate in planning to improve working conditions (for example, see Teasley et al. ) and changes in work structures to support practitioners to undertake support opportunities (for example, see Healey-Ogden ). Mentoring includes interventions where the delivery of a mentoring programme was the primary focus of the paper. There was also a collection of studies that specifically examined the mode of delivery of an intervention rather than the intervention per se. These studies are outlined in Table 3 and are explored further (below) as a contextual mechanism. Successful support interventions were found to be those that positively influence or enhance patient, service and/or staff outcomes. Table 3 describes the outcomes measured for each study and Table 5 summarises the outcomes used to characterise success. Staff outcomes were measured most frequently, generally through self-report measures such as self-reported gains in knowledge, competence and skill and/or clinical practice. Other staff outcomes included: gains in knowledge (tested via knowledge tests), feelings of isolation or socialisation (for example, connectedness with other centres or colleagues), levels of information exchange and networking, and retention (intention to leave and staff turnover). Programme outcomes were also examined and included satisfaction with the programme (relevance, ease of use, ease of access and fulfilling needs), attendance and participation levels and numbers, and level of comfort or competence with technology. Service outcomes were most frequently reported around perceived improvement in quality, safety of care and higher standards of practice. These outcomes were often also cited as patient outcomes. Other service outcomes included changes in the organisational culture and improvements in access to care and clinic efficiency. There were four cases where patient outcomes were reported. These included staff perceptions of improvements in screening procedures for clients, improved access to and quality of services, reduced number of transfers of care from rural to regional centres, improved client satisfaction with services and the completeness of health information and services received by clients. A total of ten mechanisms were identified. These are outlined in Table 6. The mind map of the relation between mechanisms and outcomes is illustrated in Figure 2. Mind map of key mechanisms and their relation to outcomes. White et al. described a government-run CME programme where an annual educational needs analysis questionnaire was distributed to all rural and remote general practitioners (GPs) to inform them of the programme. The authors reported that access to CME contributes to confidence in practising in rural and remote areas, CME strongly alleviates professional isolation and GPs are less likely to remain in practice without access to CME. On a more individual level, Tumosa et al. described a programme of rural education that requires participants to complete a survey to assess individual educational needs. The needs analysis was used to then design an appropriate mix of clinical, didactic, supervised and administrative learning experiences. Participants reported high levels of educational goal achievement from participation in the programme. A needs analysis prior to intervention was linked to the following outcomes: improved service outcomes including improved access to services, improved quality of services and more sustainable programmes; and positive staff outcomes such as perceived appropriateness of programme, perceived positive use of staff time, confidence in practicing in rural and remote areas, higher programme attendance levels, positive influence on perceived clinical skills and confidence in performing clinical interventions that they would not otherwise be able to support. Gibb et al. used an action research approach to develop an organisational definition of mentoring and to identify the qualities valued in a mentor. The findings from this action cycle were converted into questionnaires by a research team. The results of the questionnaires were used to develop a set of guidelines regarding qualities desired in mentors and mentees, as well as an evaluation tool for monitoring the mentoring relationship. Actively involving stakeholders in programme design, course or programme content, implementation and evaluation was linked to: positive changes in organisational culture towards supervision, a better understanding of the role of mentoring and supervision, higher participation levels in the programme, a perception that the content and structure of the material or programme were appropriate and relevant, higher and sustained attendance and increased sustainability of the programme. Action research, for example, involving support from university researchers can contribute to successful outcomes. One study describes how university researchers assisted a service to implement a continuing education (CE) programme for physiotherapists in rural Victoria, Australia . Researchers developed a questionnaire to assess the CE needs of physiotherapists. The results then informed the development of a CE programme and programme evaluation tools. All targets for success (as identified and defined by stakeholders) were reached. External support, organisation, facilitation and/or coordination of the programme were linked to the following outcomes: good programme attendance rates and successful knowledge translation between colleagues. Strong organisational commitment has been linked to: greater participation levels, change in organisational culture, sustainable programmes and improved patient outcomes and quality of service provision. Leadership and organisational commitment to a newly developed supervision programme, as demonstrated by a senior management team forming a clinical supervision committee to oversee implementation and evaluation of the staff-led supervision programme [33, 34], was reported to lead to a large change in culture in relation to supervision within the mental health programme. The successful adoption of best practices in rural Kenyan hospitals was related to the ‘implementing team, hospital management, and facilitator together provided leadership and supported a shift in organisational culture and commitment that helped motivate health workers and change their individual behaviours’ (p. 4) . Having access to adequate and appropriate resources (including time) to undertake or provide support programmes has been linked to greater success implementing support programmes and potentially retention of staff. Significantly greater retention rates for rural medical practitioners have been achieved through the provision of fully subsidised locum-relieved training programmes . Greater retention of nursing staff following the implementation of an 80/20 staffing model in a rural hospital has also been reported . The 80/20 model provides staff with 20% of their salaried time off from direct patient care in order to pursue various types of professional development activities. Importantly backfill positions were created to accommodate the 20% reduction in clinical duties. Having access to adequate and appropriate resources was also linked to high levels of staff satisfaction with the intervention or programme and the mode of delivery of the intervention. Perceptions of greater programme success were associated with a mentoring programme when three key elements were addressed: timing (twice weekly ‘chat’ with monthly videoconference); mode of delivery (iChat, videoconference and email); and format (‘chat’ mentoring weekly and videoconferencing where mentees take turns) . It was perceived, for example, that electronic iChat sessions replicated the colleague interaction that was generally missed in sole positions. Where the format of a support programme included opportunity for interaction, networking and/or peer support, there was a relation with successful outcomes such as reduced feelings of isolation, high access rates, completion of and participant satisfaction with the programme. This was the case for both face-to-face [46, 47, 54, 59] and non-face-to-face interventions . A randomised controlled trial examining the impact of an accredited online training program in CBT for rural and metropolitan psychologists, compared structured online modules of study with or without support from a CBT expert . The supported training group was significantly more likely to finish all training modules than the group that undertook the training without support. An online resource for rural health-care practitioners that was supplemented by online, facilitated modules also demonstrated high access rates . Where the mode of delivery was face to face, provision of funding and support (for travel, accommodation, salary, time and locum relief [50–52, 58, 65, 67]) related to successful outcomes including sustainability of (and ability to conduct) the programme and participation rates. This was also the case for non-face-to-face interventions where funding was essential to equipment provision and payment of participating specialists, teachers, mentors and supervisors [41, 42, 66]. For face-to-face interventions, where the programme was delivered, for example in a local or regional centre [44, 50, 54, 57, 65], was also important, relating to successful outcomes such as capacity to attend the programme. When interventions were delivered remotely utilising technology, the following elements were identified that related to successful outcomes: flexibility in the timing of delivery [15, 48, 59, 66]; adequate preparation for technology to work , such as an orientation to the technology and online learning approach ; external support and coordination (including organisation of technology and participants, and development or organisation of the content of sessions) [14, 36, 41, 46, 55, 56, 68, 71–73]; ease of use of technology (including adequate connection speeds) [15, 41, 42, 52, 55, 56, 59, 62],[66, 71, 73, 74]; correct use of technology and ability to use technology [41, 45, 46, 52, 62, 71, 73]; confidential transmission of patient details, information and case histories [41, 45, 66, 68, 72]; and willingness of participants to undertake self-directed learning [42, 59, 62]. These elements related to success factors including the sustainability of the programme, participation rates and participant satisfaction levels. The importance of addressing these elements was illustrated by Mitchell et al. , who reported satisfaction with and the overall success of technologically driven interventions can be impeded by: competition with other services for use of the equipment; equipment breakdown; the time required to set up a session; staff on rotating rosters not being available at a set time; difficulties with local organisational processes, including approvals; the imperfect synchronisation of lip movement and audio in videoconferencing sessions; and the high cost of sessions involving multi-site videoconferencing. These mechanisms are important for a successful online format. Ensuring access to training, skills or knowledge for supervision, education, training or mentoring has been linked to the sustainability of a programme, an improved attitude to supervision or mentoring and an increased effect on staff outcomes (perceived increases in self-reported knowledge, confidence in practice and skills). One element of a successful staff-led supervision programme was to ensure that all supervisors and supervisees received external training in supervision [33, 34]. Regular feedback and evaluation of support programmes has been linked to improved knowledge translation, sustainability of the programme and greater effect on staff outcomes. The importance of measuring success and evaluating the effectiveness of a programme at key intervals and changing the programme in response to feedback was demonstrated in a study of electronic mentoring of rural paediatric physiotherapists . The study demonstrated improved communication between mentor and mentees and improved clinical reasoning, confidence and knowledge translation. Officially launching a supervision programme, as described in two studies, had a twofold effect: (i) it demonstrated organisational commitment and (ii) it increased awareness of and participation in the programme [33, 34]. Networking and supportive relationships refer to networking opportunities, peer relationships, relationships with experts and specialists and relationships with the community. They are linked with high levels of participant satisfaction with the intervention or programme, greater attendance rates, improved knowledge of roles, retention of health workers, improved quality or safety of practice and improved reflective practice. Retention of GPs for longer than a four-year period across four rural communities in Canada was found to be related to community factors such as appreciation shown by the community for the practitioner and community connection or a sense of belonging and integration into the community . The absence of supportive relationships has been related to declining birth rates in rural areas, because there were fewer trained staff to provide maternity services. One study describes how scant access to birthing experiences and therefore experienced mentors for new nurses to gain this experience, restricts access to maternity services for rural clients . 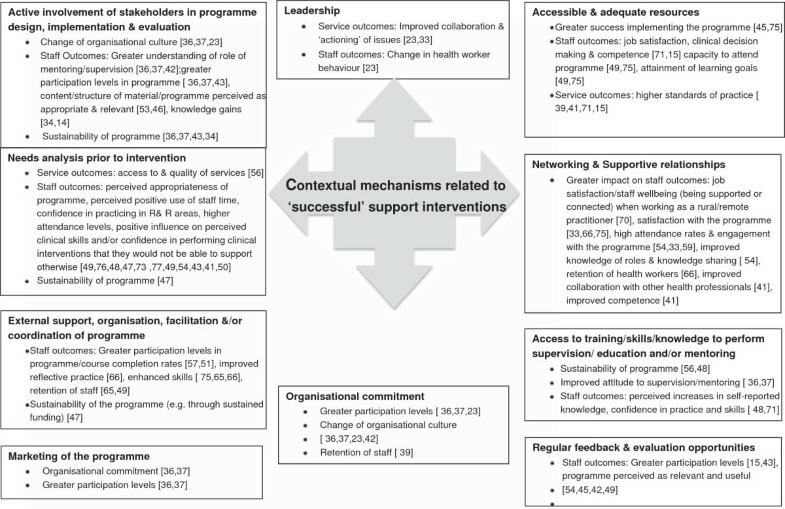 This synthesis has identified a number of support interventions for health-care practitioners in rural and remote contexts, the outcomes that such interventions can generate and has identified mechanisms, specific to rural and remote contexts, that relate to successful outcomes for staff, patients and services. We identified that the outcomes of support interventions for practitioners in rural and remote contexts may be enhanced if the support strategy includes: consultation with staff prior to the programme to assess individual, collective and context specific needs; external support; accessible and adequate resources assisting staff to undertake or access the programme; and interactive and networking opportunities. Professional networking, education and supervision opportunities for rural and remote health-care practitioners have increased with the availability and use of the internet . We found that for programmes delivered remotely using technology, outcomes such as engagement with the programme, reduction of feelings of isolation, achievement of learning outcomes and knowledge gains and participant satisfaction may be further enhanced if there is a ‘human element’ to the programme, such as networking opportunities, online facilitation and/or interactive learning elements. Interactive techniques have been shown elsewhere to be the most effective educational technique for changing physician care and influencing patient outcomes . However, to gain such benefits, the format and timing of the technologically driven support strategy also need to be carefully considered such that they are user friendly and flexible enough to be accessed by participants at convenient times. Most importantly, in rural and remote contexts the evidence suggests that supporting practitioners to access support interventions by means of financial reimbursement, travel subsidies, backfilling and organisational commitment can directly or indirectly influence retention of staff and the quality and safety of services. A recent meta-synthesis of recruitment and retention of occupational therapists and physiotherapists in rural regions supports these findings. Support from the organisation influences retention and with support, challenges can become rewards and assets . These findings are also consistent with Humphreys and colleagues’ research examining the relation between education, training and retention of the rural primary health-care workforce . Furthermore it has been demonstrated that without organisational commitment, efforts to change clinical practice by influencing individuals is ineffective . 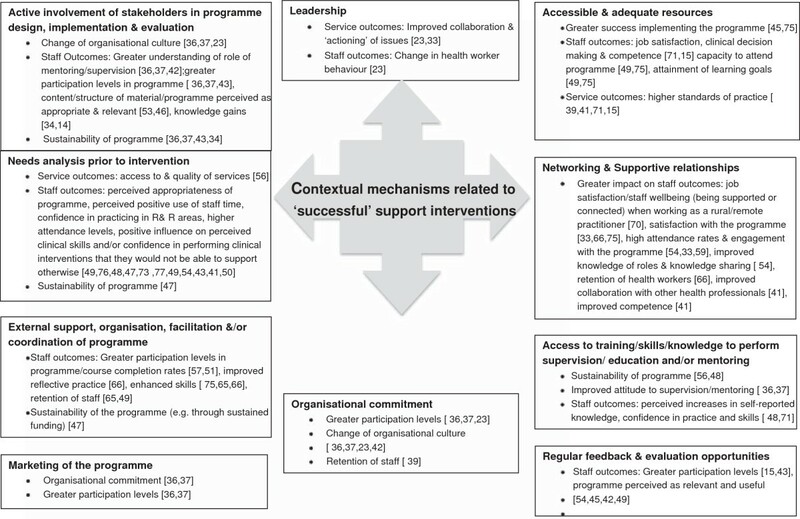 This review has attempted to capture the complexity of the mechanisms required in a rural and remote context to operationalise a successful support intervention for health-care practitioners. We therefore chose not to exclude research on the basis of quality, opting instead to extract a fuller understanding of ‘relationships, mechanisms and meaning’ within the evidence base . This form of exploration is something a traditional systematic review is limited in performing , particularly in rural and remote contexts , despite or because of inclusion of high-quality research. As such, both approaches have their limitations. The most rigorous sources of evidence included in this review were also the leanest on contextual and mechanism data. For example, Gorsche and Woloschuk conducted a longitudinal matched case–control study  that importantly found that retention of rural and remote GPs can be significantly enhanced through provision of training. The mechanisms that produced this result, however, are not clear. On the other hand, Healey-Ogden et al. described a number of mechanisms that lend support to the premise that financially supporting professional development opportunities can lead to retention of staff; however, the study is of low quality. There is an inherent difficultly therefore in balancing scientific rigour with identification, exploration and reporting of contextual elements that may influence the outcome of a support intervention in a complex context such as the rural and remote health-care environment. There was a dominance of literature pertaining to education and training interventions and a dearth of literature evaluating support, supervision and mentoring interventions. The mechanisms identified in this review may, therefore, not reflect the entirety of mechanisms required for successfully supporting health practitioners in rural and remote health-care contexts. This limitation may have been partially addressed through the undertaking of additional hand searches of cited reference lists or searches within the grey literature. Neither of these strategies, however, were undertaken for this review. Measures of success in this review have been influenced by the nature of the research methodologies and corresponding measurement tools employed by the reviewed papers. There was an overrepresentation, for example, of papers that measured the success of an intervention in terms of self-reported staff outcomes such as knowledge, skill or confidence gains utilising unvalidated questionnaires. The review has focussed on identifying relations between contexts, mechanisms and outcomes. Although an integrative review methodology and thematic analysis were employed, further research investigating these relations may be strengthened by the use of inductive logic reasoning . This combines programme logic , realistic evaluation  and other structure-process-outcome models to extract and organise the data systematically under the headings: drivers, contexts, mechanisms (barriers and facilitators), outputs and outcomes. Despite the importance of enabling and facilitating access to support for health-care practitioners in rural and remote contexts, the capacity of a practitioner to access a support intervention was rarely used as a measure of success nor were the factors that facilitated or hindered a practitioner from accessing support explored. Attendance rates or completion rates of the intervention were proxies. There was also little information on the effect of supervision interventions on any outcomes. Equally, only four papers identified the retention of health workers as an outcome of interest. Through synthesis of the literature, this research has identified a number of key mechanisms that are associated with successful support interventions for health-care practitioners in rural and remote health-care contexts. In particular, there is a need for health-care organisations to make a commitment to actively enable practitioners in rural and remote contexts to access support interventions. This review has identified a need for better quality research, in particular research assessing supervision interventions and retention as an outcome of support strategies, to enable more concrete conclusions to be drawn regarding the direct effect of support interventions for rural and remote health-care practitioners on staff, patient and service outcomes. This research was made possible through funding provided by the New South Wales Department of Health in partnership with the Greater Southern Area Health Service (Southern and Murrumbidgee Local Health Districts). JY carried out the literature searches. AM and JY carried out the initial screening process. AM, JC, RP, DB and JY screened all papers for inclusion. AM carried out the thematic analysis and wrote the paper. SN assisted with thematic analysis and advised on the theoretical approach. AM conceived the study and drafted the initial manuscript. JC, RP, DB, JY and SN participated in its design and coordination and helped to draft and review the manuscript. All authors read and approved the final manuscript.